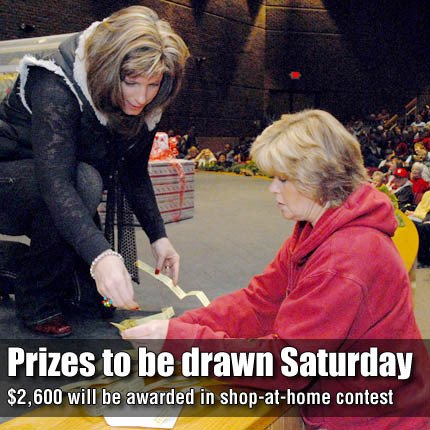 OSAGE CITY—The countdown is on for The Herald-Chronicle’s Christmas On Us grand prize drawing for two $1,000 prizes, and two $250 prizes to be held 9 a.m. Saturday, Dec. 17 in the Osage City High School auditorium. Coffee and donuts will be served by the newspaper staff beginning at 8:15 a.m. in the school cafeteria, located at 515 Ellinwood, Osage City. The Santa Fe Trail Choraliers will entertain those in attendance during the drawing. A new addition to this year’s grand prize drawing, door prizes will be given away. Three more winners claimed instant prizes in the Christmas on Us promotion last week, with only two $50 prizes up for grabs before the grand prize drawing begins Saturday. Jennifer Burkdoll, Scranton, claimed her prize after finding her ticket number in the Dollar General - Carbondale advertisement last week. She received the ticket after making a purchase at D&D Tire, Scranton, and believes she will return there to spend her winnings. Charles “Tug” Atchison, Burlingame, won $50 in scrip after making a purchase at Overbrook Family Dentistry. His ticket number was hidden in the Caffe Thyme ad in last week’s newspaper. Tosha Meek, Osage City, also won $50 in scrip, which can be spent at any of the 37 participating sponsors in this year’s promotion. She received her winning ticket from Jerry’s Thriftway and saw the number hidden in the Relaxation Station ad. Meek said she will probably spend the prize money on Christmas gifts. With two $50 instant prizes remaining to be won before the grand prize drawing Saturday, it’s no coincidence there are two ticket numbers hidden in this week’s Christmas on Us ads, which can be found on pages 1B, 3B, 4B and 8B of this week’s Herald-Chronicle. The only unclaimed number from last week came from Rustic Treasures, hidden in the Osage Hardware ad. Instant prizes may be claimed at the newspaper office during business hours Thursday and Friday, and up until 9 a.m. Saturday Dec. 17 at the auditorium before the grand prize drawing begins. Scrip money is only good at the 37 participating businesses.